Bruker Corporation (NASDAQ:BRKR) today announced that the DE-tectorTM has successfully met the new European Civil Aviation Conference’s (ECAC) Common Evaluation Process of Security Equipment (CEP) for airport checkpoint screening of passengers and baggage. 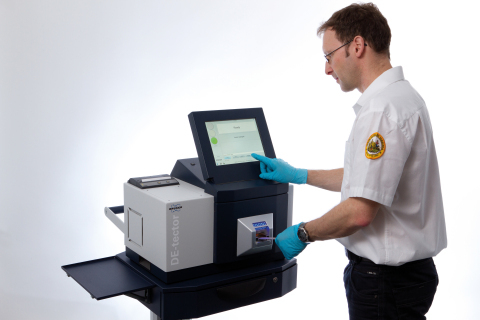 The DE-tector is the first European-built explosives trace detection (ETD) instrument to pass the demanding ECAC testing protocol which was established to set standards for the performance of security equipment across the forty four member nations of ECAC. The DE-tector system is a bench-top explosives trace detector using Ion Mobility Spectrometry. Using the patented, non-radioactive HEPITM-source, the DE-tector lowers the administrative and compliance burden on our customer significantly. The system provides exceptional trace detection capabilities whilst maintaining an exceptionally low false alarm rate. An intuitive ‘traffic light’ user interface and minimized user interaction resulting from the incorporation of automatic calibration, along with a 12-month maintenance cycle, reduces the total cost of training, maintenance and operation. About Bruker: Bruker Corporation (NASDAQ:BRKR) is a leading provider of high-performance scientific instruments and solutions for molecular and materials research, as well as for in vitro diagnostics, industrial and applied analysis.